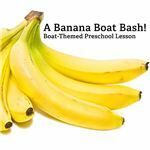 In this preschool lesson plan, preschoolers will learn how to make a banana boat and talk about different boats that are used for travel and transportation. This lesson will help develop creative skills as well as speech and comprehension skills in your students/children. This preschool lesson plan shows preschoolers how to make a simple boat out of a banana using toothpicks and sweet wrappers. This boat-themed lesson is intended to introduce preschoolers to modes of transportation used on rivers, lakes and sea. Take a banana, hold it lengthwise and peel off just one flap section of the peel from the upper side. This will be the deck of your banana boat. Prick holes into the sweet wrappers and insert in the toothpicks so that the wrappers look like sails on masts made from toothpicks. Ask the children to get as creative as they want with the sails. Stick the toothpicks into the banana so the masts and sails stand up straight. You can color the bark of the boat - the remaining intact peel of the banana - with edible food coloring. You can use chopped cherries and colored sugar to decorate the boat deck. Stick the cherries on the toothpicks and sprinkle the sugar on the exposed part of the banana. Display everyone's boats and encourage the preschoolers to talk about their boats. You can have a boat christening ceremony and drink orange juice on the occasion. Then each child can eat his or her own banana boat. Tell the preschoolers that people use boats for travel and transportation purposes. Some boats are used to travel over small distances while others are used for long distance travel. Talk about the different kinds of boats there are - row boats, skiffs, wherries, yachts, ocean liners, etc. You can take the preschoolers to visit a boat museum and/or for an outing to a local harbor, if there is one. You can also show the kids photographs and posters of boats. Inform the children about the different parts of a boat, like deck, mast, sail, engine, anchor and so on. Show the kids what these are. Talk about the kinds of things that can be transported on boats. Banana boats of course transport bananas. Other things transported in other boats include food, clothes, vehicles, machines, animals, people and so on. The goods to be transported are usually put into the cargo hold of the boat or stored on the boat deck. Boats that are used to transport people have sitting, sleeping, eating and entertainment areas so that the passengers can travel in comfort. Talk about how some people actually live on boats. Their boats are fitted with most of the useful accessories and things that we have in our land-bound homes. Give the preschoolers some sheets of drawing paper and ask them to draw a boat on the water or in a harbor. Show them how to write the words 'Boat' and 'Banana'. Show the preschoolers videos of boats. Listen to Harry Belafonte's song 'Banana Boat Song'. These boat-themed activities are sure to get your preschoolers more interested in all types of boats...especially the ones they can eat! Have fun!